2015 marks the 75th Anniversary of the Battle of Britain and many commemorative events are planned throughout the year. 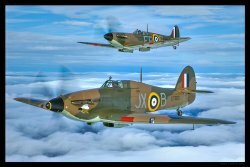 To get you in the mood, here are the Battle of Britain Memorial Flight’s Hurricane Mark IIc LF363 and Spitfire Mark IIa P7350 in BoB markings, captured in a sky typical of those dramatic summer months in 1940 when Britain stood alone against the might of the Luftwaffe. 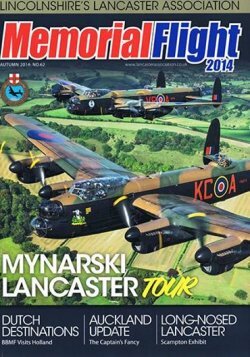 The Autumn issue of LLA's in house magazine "Memorial Flight" features one of John's 2 Lancaster photos on its front cover. Also featured inside is a photo of the "3 Avros" over Lincoln taken on 21st August 2014. 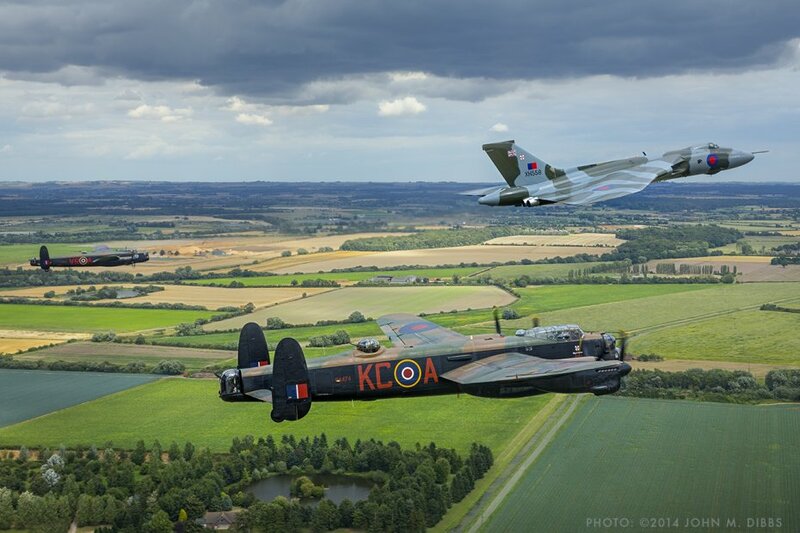 In the New Year LLA will be selling a a photo of Lancaster B.I PA474 and Vulcan B.2 XH558 taken during this sortie. 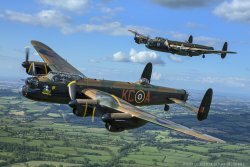 In cooperation with Lincolnshire's Lancaster Association (LLA) we are selling two photographic prints from John's air-to-air sortie with the 2 Lancasters on 23rd August 2014. 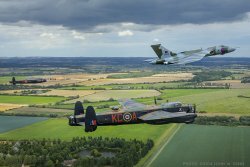 Purchasers will be helping support the work of the LLA (a registered charity) in its role as the official support group of the Battle of Britain Memorial Flight. The Plane Picture Company does not sell prints via its own website. 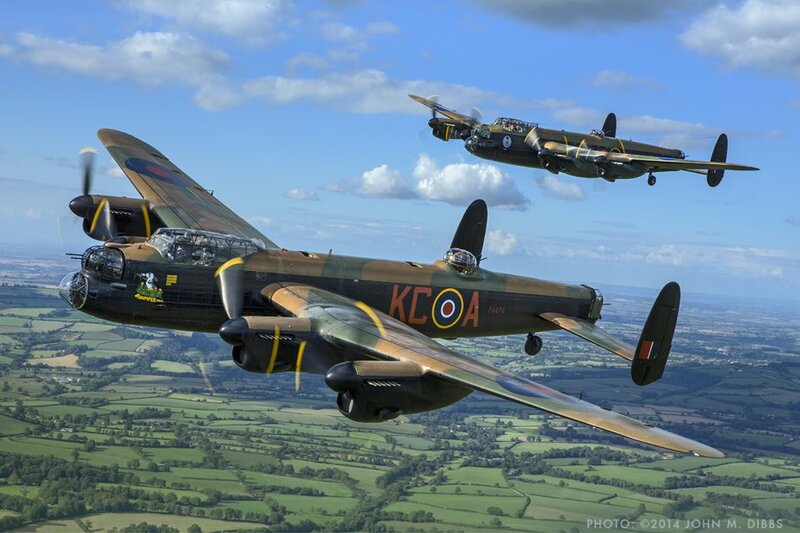 The November edition of FlyPast magazine features several shots from Dibbsy's sortie with the 2 Lancasters on 23rd August as they headed to Dawlish for their display. The weather was kind allowing these magnificent aircraft from the Battle of Britain Memorial Flight (PA474) and the Canadian Warplane Heritage Museum (KB726) to be beautifully captured in their element over the stunning English countryside. Thanks to all at the BBMF and CWHM for their assistance in arranging this once in a life-time sortie. On 21st August, John photographed 3 iconic Avro bombers in the skies over Lincolnshire in a once in a life-time sortie. Vulcan XH558 led the formation with the only 2 airworthy Lancasters completing the majestic 3-ship. After departing RAF Waddington, the Avros flew over the site of the new Bomber Command Memorial in Lincoln then performed flypasts at Metheringham airfield and RAF Coningsby on route to RAF Marham. The event attracted huge crowds despite the less than ideal weather and certainly was a day to remember not least for the WWII veterans in attendance. Thanks to all at the Battle of Britain Memorial Flight (especially CO Sq Leader Dunc Mason for selecting Dibbsy for this shoot), The Canadian Warplane Heritage Museum, Vulcan to the Sky and to all those at 100 Squadron who arranged and flew (Flt Lt Si Duttton) the camera-ship Hawk. In somewhat better weather conditions on 23rd August, Dibbsy was once again airborne in the company of the BBMF and CWHM Lancasters as they transited from Bournemouth to Dawlish. 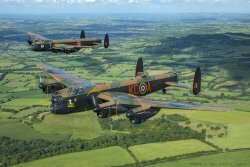 This was a special shoot for FlyPast and the photos will be released in due course - suffice to say the images of 2 Lancaster bombers in close formation over the Devon countryside are really special.